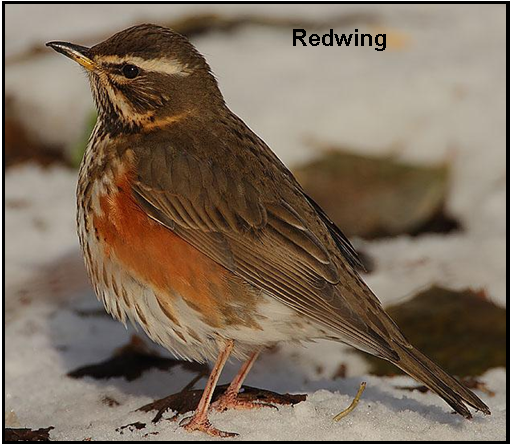 November signals the coming of colder weather as redwings and fieldfares arrive to avoid the harsh Scandinavian winter. 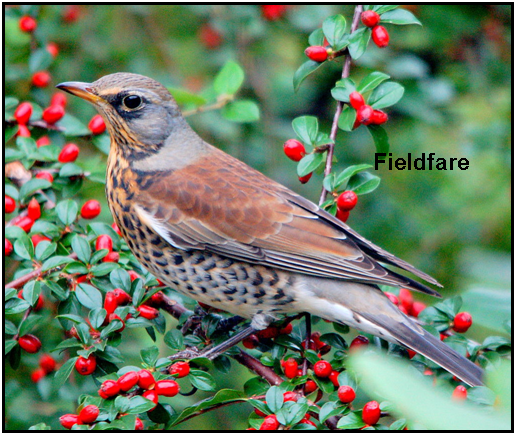 The fieldfares’ ‘chak-chak’ resounds across recently ploughed fields while the high-pitched ‘seep’ of redwings is often heard as they pass overhead at night. These close relations of blackbirds and song thrushes, like most small birds, migrate under the cover of darkness to avoid avian predators, using the position of stars and the earth’s magnetic field to guide them. If you come across a flock while you are out on a country walk around the village, take a moment to check for any blackbirds or thrushes amongst them as it is likely that some of them too will be seasonal visitors from mainland Europe. A song thrush that we ringed at Marden in January this year was later trapped again twice - in May and June - in Holland, where it was breeding. So it could return to winter in Kent again this year. Continental blackbirds often seem to have slightly silvery edges to their feathers which can stand out quite clearly if they are next to our native birds, so you may be able to spot them through binoculars. More importantly, just pause and reflect on the wonder that they are there at all: unlike we humans, increasingly isolating ourselves and our children from the natural world, birds and other animals are still in tune with it. Every year, billions of birds, insects, fish and mammals move around the globe, navigating in ways that scarcely seem possible to us, and we are only just beginning to understand the secrets of how they do this. Like birds, we too need to be in tune with a healthy natural world if we are to survive as a species. We don’t just need the planet’s natural resources to provide us with food and shelter either; many modern drugs were originally derived from wild plants (eg. the contraceptive pill and digitalis for heart conditions) and animals (eg. horseshoe crab blood is used to create safe vaccines and the venom of a tropical wasp can be used to attack cancer cells). But we are destroying the (our) natural world at a faster rate than has ever happened before - apart from the collision with that damned asteroid 66 million years ago! – so we are losing the source of a myriad medical, technological and industrial benefits before we have even discovered them! Studying how young zebra finches, for example, learn to sing is providing us with new insights into autism. Investigating the chaffinch’s ability to regenerate brain cells in the spring for its territorial song, combined with developments in stem-cell biology, promises potential treatments for Parkinson’s and Altzeimer’s. 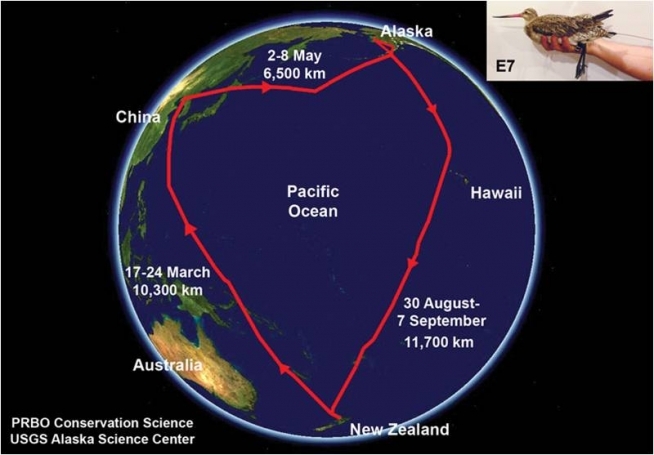 The recent discovery from satellite-tracking technology that the bar-tailed godwit migrates from Alaska to New Zealand in one continuous 11,700 km flight lasting 9 days has also led us to discover the birds’ ability to shrink all their digestive organs for the flight - they’re ‘not needed on the flight’ as it were. They are regenerated when they land ready to digest food again. If we can identify the gene that switches the process on and off it could lead to treatment for human obesity. But if the bird becomes extinct we lose the potential resource – and this particular species' population is predicted to halve in the next ten years due to habitat loss. So appreciate, and look out for, The Farleighs’ birds. They are part of a precious, but fast-disappearing, resource. We destroy it at our peril.